This can be done inside on a griddle or outside on the grill. If neither is available, use a large skillet! Remember that Skirt Steak is among the most flavorful of cuts, but it can also get tough if overcooked. So err on the side of under-cooking and always always slice very thinly across the grain. 2) If desired, marinate for 30 minutes for cooking. 3) If not marinating, rub each steak with olive oil, then sprinkle generously with salt and pepper. 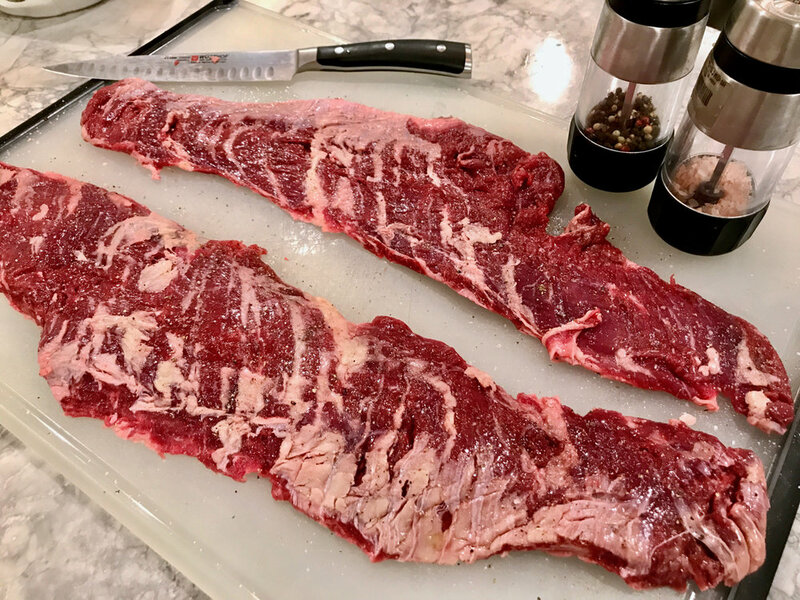 4) Cut each skirt steak in half to make them more manageable. Make sure they are at room temperature before cooking. 5) Over medium high heat on a stovetop griddle or over a medium high flame on your grill, sear each side once for 2 minutes, then again for about 45 seconds if you desire medium rare doneness. 7) To serve- slice very thinly, at a slant, across the grain in order to ensure tenderness.